Call 607-354-4153 to schedule your first appointment. If you're missing out on life due to an inability to hear and understand conversations with people around you, you should consider visiting Miracle-Ear®. We're the most recognized brand of hearing aids in Corning, NY, and around the country. We offer an extensive line of hearing aids, and our experienced specialists will work with you to choose the hearing aid that's right for you. Our hearing aids also come with a 30-day, risk-free trial. I avoid social situations because I'm afraid that I won't be able to hear. I avoid meeting new people because I'm worried I won't be able to understand them. I have a constant ringing in my ears. I have more trouble hearing women and children than men. Miracle-Ear takes pride in its use of the latest advances in hearing aid technology. Our GENIUS™ Technology allows you to focus your hearing directly in front of you so that conversations occurring around you don't interfere. It can also automatically detect and focus on the main speech source in the room regardless of where it's located. Although a hearing aid with GENIUS™ Technology has many advanced features, it is easy to control and adjust using your cellphone with our free smartphone apps**. The quality of your life is affected by the quality of your hearing. If you're suffering from hearing loss, Miracle-Ear hearing aids may be just what you need. You can receive free regular checkups for your hearing aids at any of our more than 1300 locations nationwide. Call or visit our hearing aid center in Corning today to discover and experience the Miracle-Ear® Advantage. 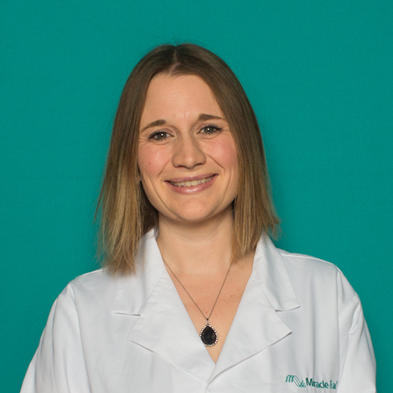 Jennifer has worked with Miracle-Ear as a Hearing Instrument Specialist for two years. Jennifer is a state licensed hearing instrument specialist. Through online courses and attending conferences, she continues to further her education in the latest technology and programs that can improve quality of life. Recently, she has received two awards for Most Improved Store and Rookie Of the Year. Jennifer's favorite part of working at Miracle-Ear is knowing that she is able to help improve someone's quality of life.